HIPAA Violation | 8x8 | 8x8, Inc.
Understanding what a HIPAA violation is and what causes them to occur is vital for businesses and individuals who work in healthcare-related fields and their business partners. In many instances, organizations are responsible for their own HIPAA violation reporting when they find out that a data breach or careless sharing of information has occurred. Because of the digital age in which we live, the opportunities to accidentally violate HIPAA laws has increased exponentially. Here we answer common questions like "what is a HIPAA violation?" and "how can my organization stay compliant?" Employees sharing unauthorized information about patients with friends or coworkers. Mishandling of printed medical records when employees leave charts and other confidential information in public view. Lost or stolen digital devices, such as smartphones, laptops, desktops and tablets. Texting health information without using an encrypted program to ensure the information isn't intercepted. Posting information about patients or their conditions on social media. Unauthorized employee access of patient information for the purpose of satisfying curiosity, getting revenge or selling the information. Social conversations when a friend or family member asks a medical provider information about a patient that they are not authorized to discuss. Sharing information without a written authorization — verbal consent is not enough. Accessing information on digital devices away from the office. Safety and security measures must be in place before this can be done. HIPAA violation reporting is primely the responsibility of the offending organization when it finds that it has not been in compliance. To avoid violating HIPAA, you should always seek ways to educate yourself about HIPAA compliance. Before you ask what is a HIPAA violation, you first need to know what Protected Health Information (PHI) is. PHI refers to a patient's private health-related information. The HIPAA Privacy Rule says patients deserve the right to have access to their own protected health information and that healthcare organizations and other related businesses must respect patients' right to privacy when treating them. PHI may be shared in many instances, but should only be shared in accordance with the guidelines established in the HIPAA Privacy Rule. The penalties handed down to organizations that are found to have committed a HIPAA violation vary greatly, depending on the severity of the violation and the intent. Non-compliance with HIPAA laws can result in anything from fines to jail time. An unknowing violation can result in anything from $100 per violation to $50,000 per violation. Penalties are also assessed to organizations who willfully neglect HIPAA laws, but rectify the situation within a required time period. More harsh financial penalties are doled out to those groups that are found to be willfully negligent, but don't resolve the situation within a specified time frame. The minimum penalty for this type of HIPAA violation is $50,000 per violation and a maximum of $1.5 million annually. The Department of Justice oversees criminal penalties related to HIPAA violation reporting. Individuals who knowingly obtain PHI could face up to one year in prison. Violations that occur under false pretenses could bring with them a punishment of up to five years in prison. Lastly, those who access PHI with the intent to achieve a financial or personal gain can face imprisonment of up to 10 years. The good news for healthcare providers and other related organizations is that utilizing the right tools give you a tremendous amount of safety in reducing HIPAA violation risk. For example, 8x8 business phone services allow for secure phone calls and chats among caregivers and other staff. Likewise, doctors or staff are able to converse remotely with patients — while still ensuring that the conversation is private and secure. 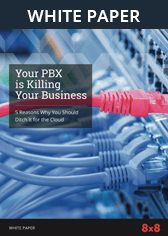 Because 8x8 is among the vanguard of VoIP providers, security and HIPAA compliance is always at the top of mind. In fact, 8x8 has received third-party validation of its HIPAA compliance.